Have you ever had a moment where you just realized you had been blind to something? Perhaps an experience you didn’t know existed, or maybe an emotional feeling you had never felt before, kind of like trying to find a word that could convey something to another person but realizing there doesn’t exist a word that serves that meaning? What I learned over the past few days is that this love I have for love itself has been completely limited by the confines of the narrow exposure I have had until this point in my life. Suddenly, the dozens of weddings I have attended throughout my life and the pure bliss I received simply from my attendance at such a sacred occasion, was revealed to be woefully incomplete. 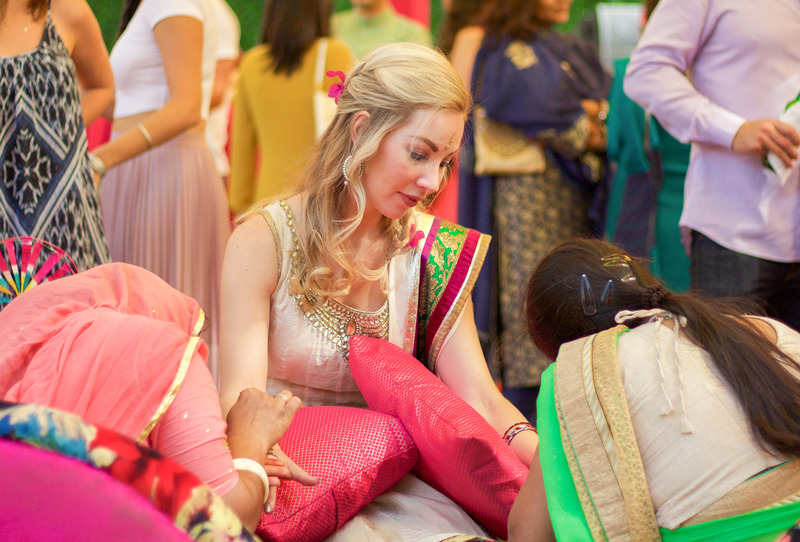 What I am getting at here is, having for the first time in my life attended the wedding of a culture completely different from my own has totally wholly changed my perspective and perception of this beautiful ritual. And it has expanded the measurement and filters through which I view love, marriage, and, frankly, the world itself. Aditi is one of the first people we met in Boston while John was attending MIT. Aditi’s positive energy and upbeat spirit fill any room she walks into. We were there to witness her courtship with Jay, who was also at MIT a year ahead of us. 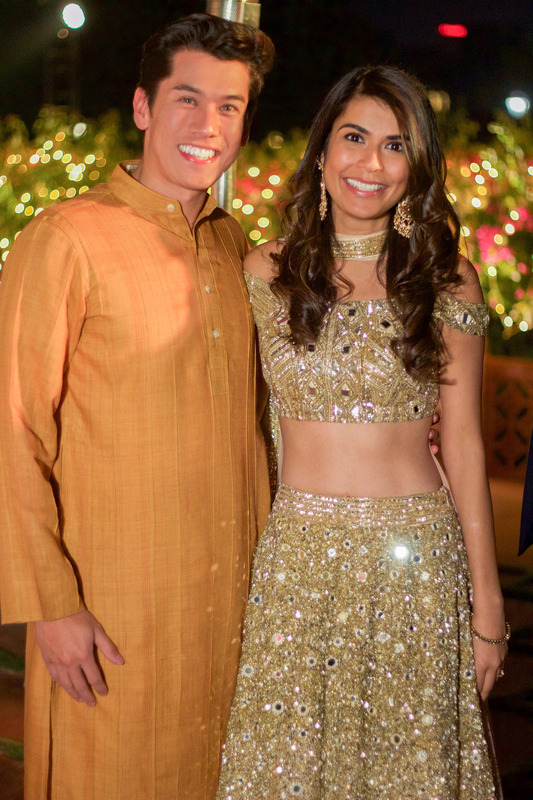 I think everybody knew these two were perfect for each other, so it wasn’t at all a surprise when they got engaged and details for their wedding landed on our calendars for November 2017 in India. 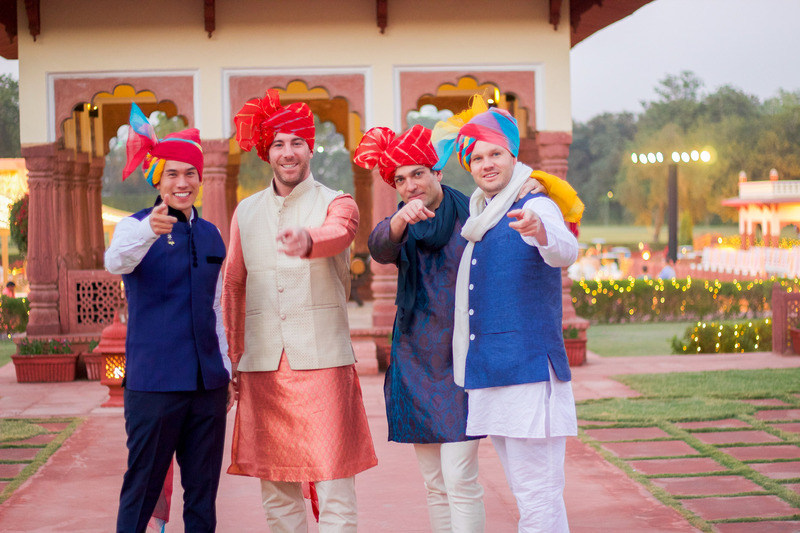 We had months to plan the details of our trip, and the excitement was accentuated knowing that many of our friends from Boston, who now live all over the world, would all be meeting in Jaipur to celebrate together. By FAR the most challenging part of the process for me was having a complete lack of knowledge on what to expect and what to wear. 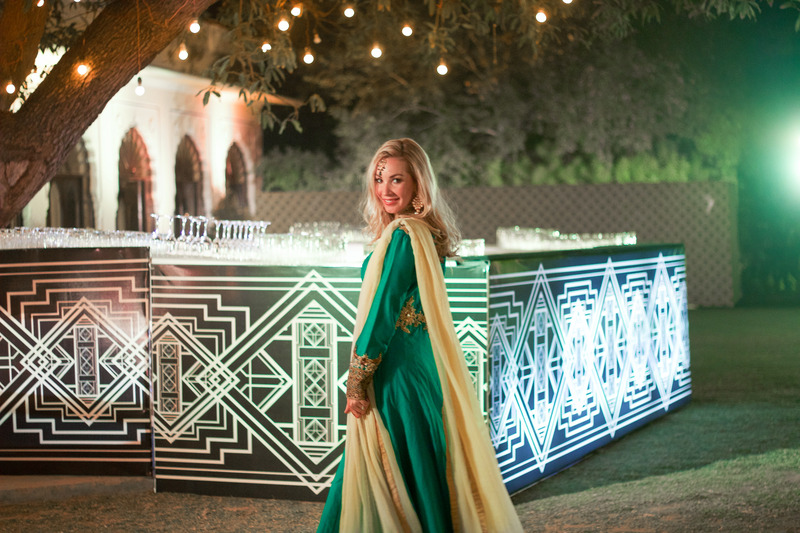 As I mentioned before, I have only ever attended western weddings and there are tons of unspoken rules and norms (such as the classic never wear white) I was worried that these similar social norms/expectations would be lost in ignorance. Luckily our lovely bride spent lots of time explaining to me what different outfits would be appropriate and what each event would be like. Luckily for me a friend in Los Angeles (who is Indian and about my same size) graciously sent me some clothing to borrow and all of the options were totally gorgeous. After sending pictures of each outfit to Aditi, she suggested that to the welcome party I wear the salmon colored sari – it’s formal enough for the occasion but this particular sari had been “prestitched” meaning it should go on easily (or so I thought…) without the assistance of the throng of women who would be present on the wedding day to adorn all of the sari’s. 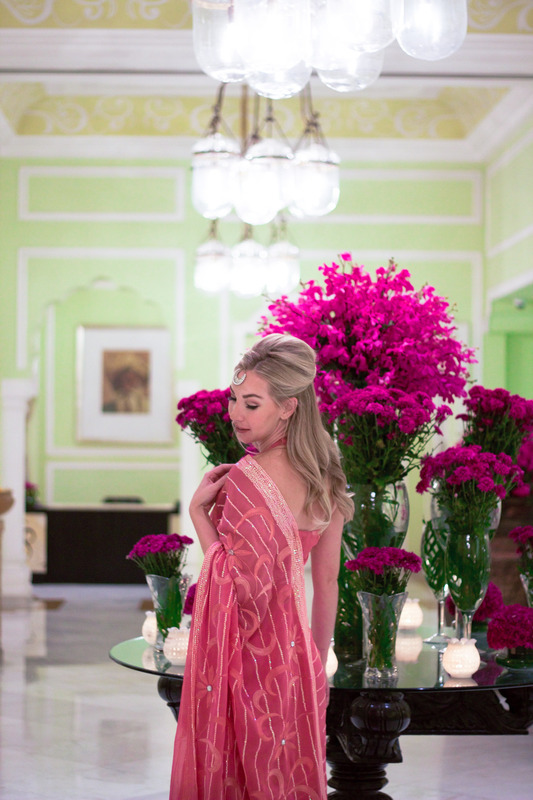 The Welcome Party was, as expected, a gorgeous event and my first time wearing a sari and a tika (the head piece shown in photos) was a complete dream! My lovely multicultural friends always make a point to explain things to me in the most relatable of terms. 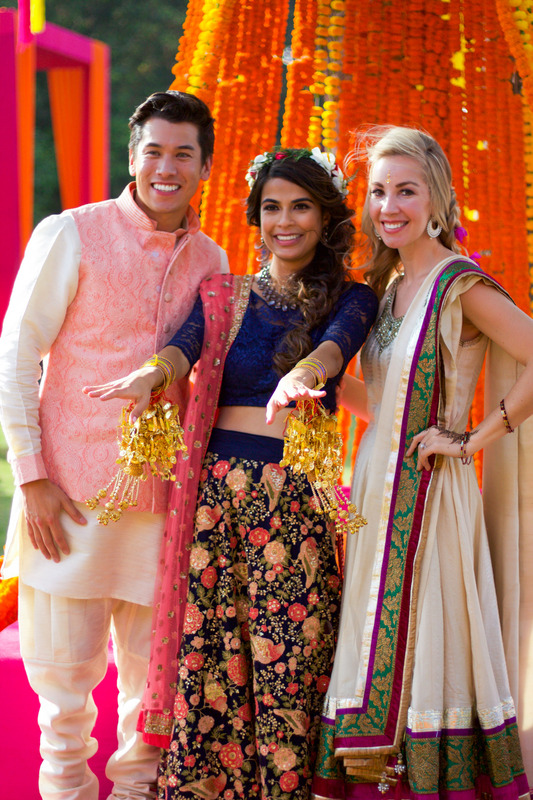 When discussing what to wear to this event, Aditi told me to think about it like a western bridal shower (held during the day, celebrating the bride and carrying on some fun traditions). She said people would be wearing things that appeared more casual than the night time events in lighter fabrics. 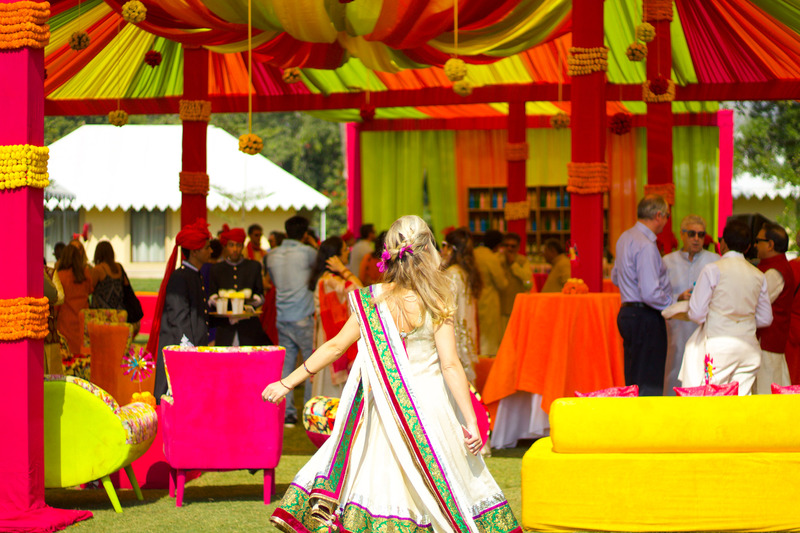 This particular event completely blew me away, it was held by the palace pool and gardens and decorated in the brightest most beautiful colors (if you know anything about me it’s that I love bright saturated colors :-). To my delight I learned that all of the women would receive intricate henna designs (I thought that this was just for the bride). This event was also my favorite food because they served traditional style street foods. 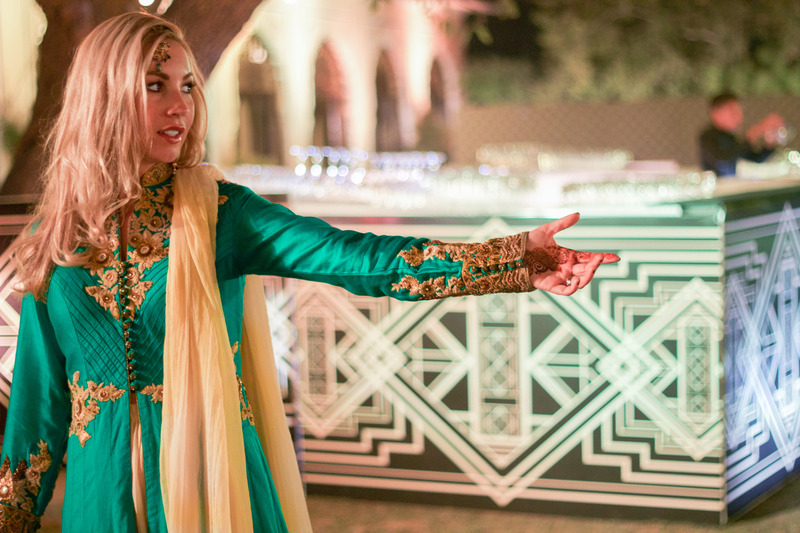 We danced, we drank, we ate, we adorned henna designs and bangle bracelets, we celebrated the bride by adorning her wrists with golden bracelets and giving her our well wishes. It was magical. With full bellies, painted hands, and tired feet we made our way back to our rooms to get ready for the next huge event, the Sangeet, being held in the evening of the same day. 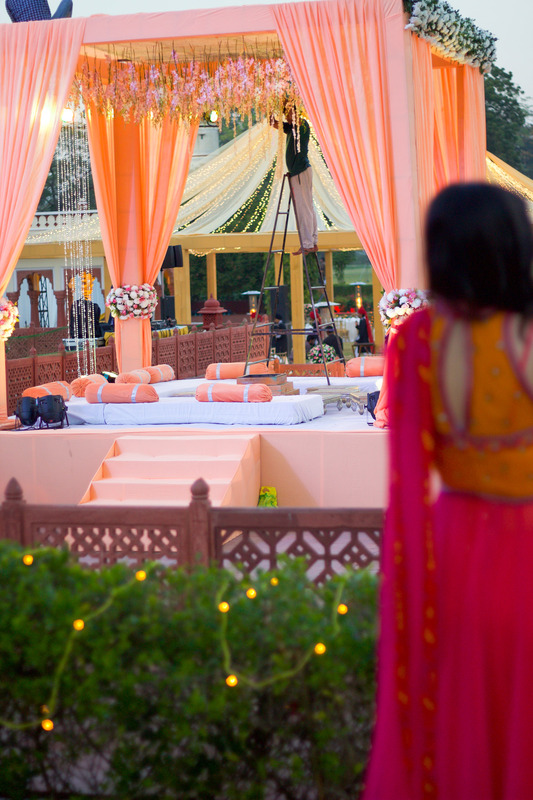 The Sangeet was the event which the was most hyped. This was the biggest “party night,” complete with a full fledged dance performance starring all of Jay and Aditi’s closest friends (myself included) and family. We had been practicing our parts for the past few days and it was finally our moment to perform. Aditi told me that this was the night I would see the most lavish outfits. People donned their finest black tie outfits, and for most of the ladies this meant intricate Lehengas and sparkling saris. My excitement (aka nerves) for the dance routine stifled my photography-mind, so I only have a few pictures of this event but let me tell you, we danced the night away. Most people not returning to our hotel rooms until after 3am. 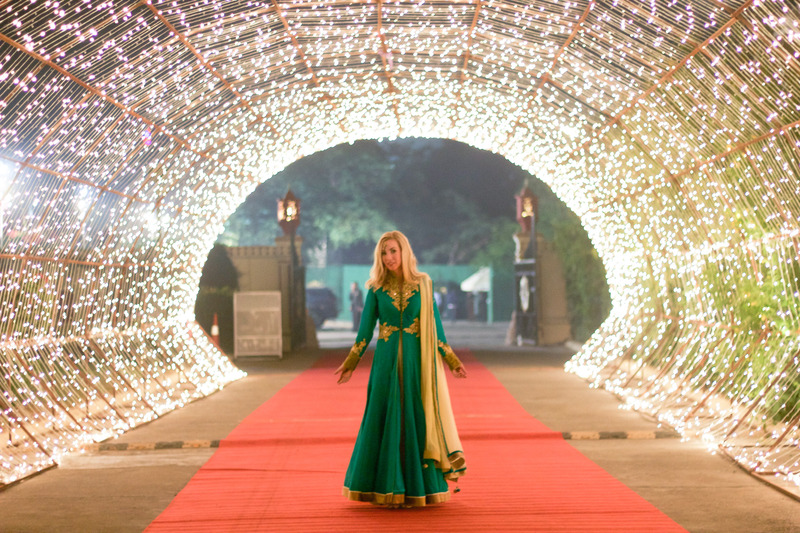 I didn’t think it was possible to top the three previous events we had attended, but sure enough the wedding ceremony itself surpassed all three in its expansive beauty, detailed decor, and most importantly its display of cultural ceremony. 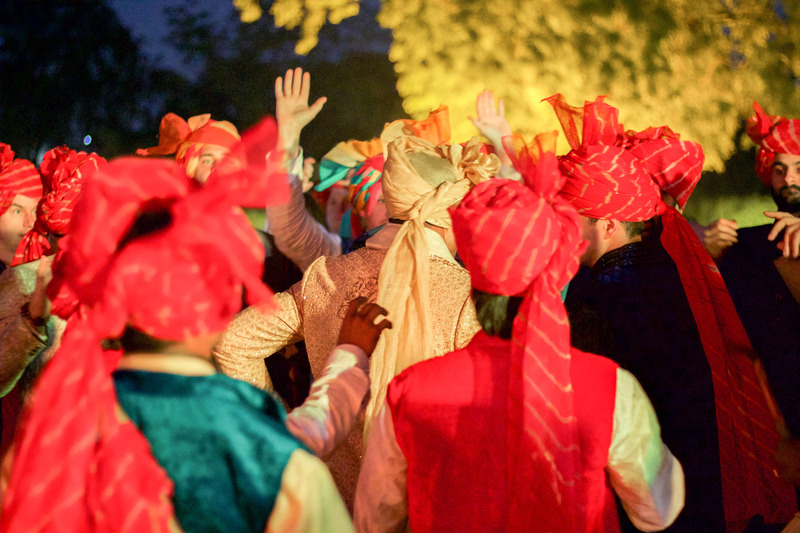 The evening started with the men gathering to receive turbans in an intricate ceremony. 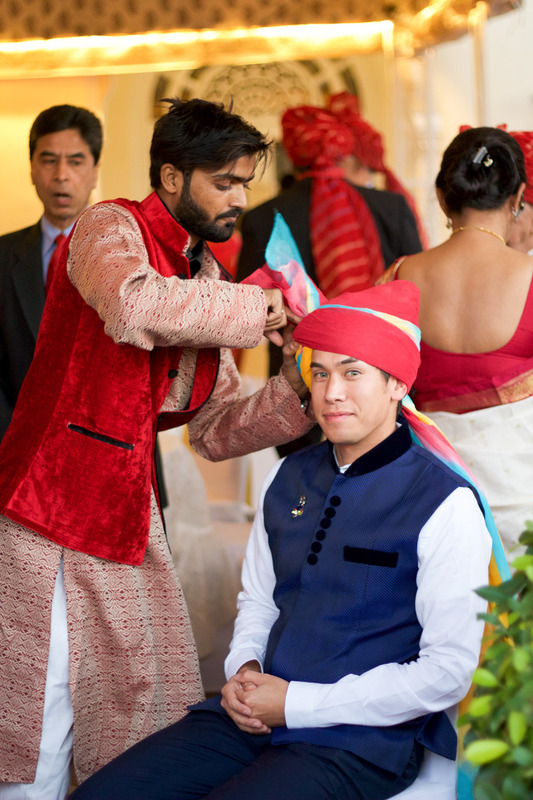 Just as with the Mehndi, being able to actually be involved in these cultural tradition and wear the cultural clothing was what made this wedding really special. 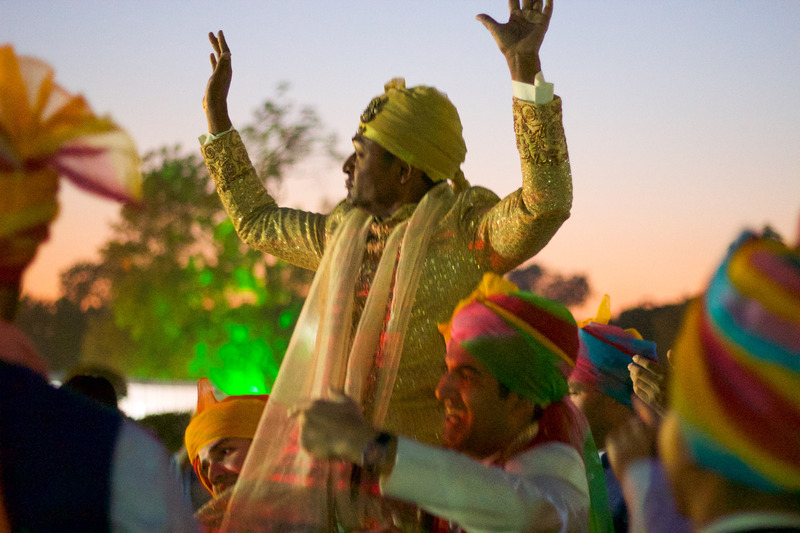 This was followed by the baraat (maybe my favorite tradition of the whole wedding), which is a parade, complete with drums and animals and revelry, that brings the groom, along with all of the men in tow, to the ceremony for the wedding. Sometimes, when the drinks really get flowing, these baraats can last for hours. It was amazing to see all of the men, especially the groom, using this event get hyped for the nuptials to come. 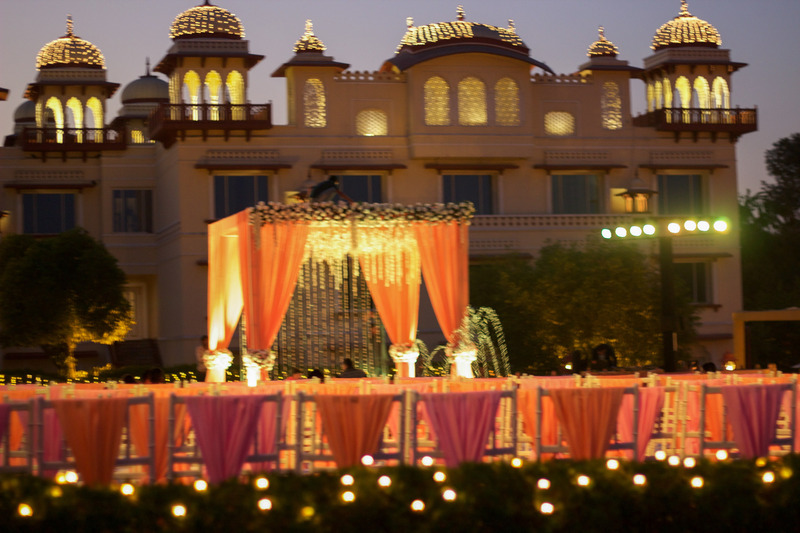 The wedding itself was a spectacle in extravagance and ceremony. 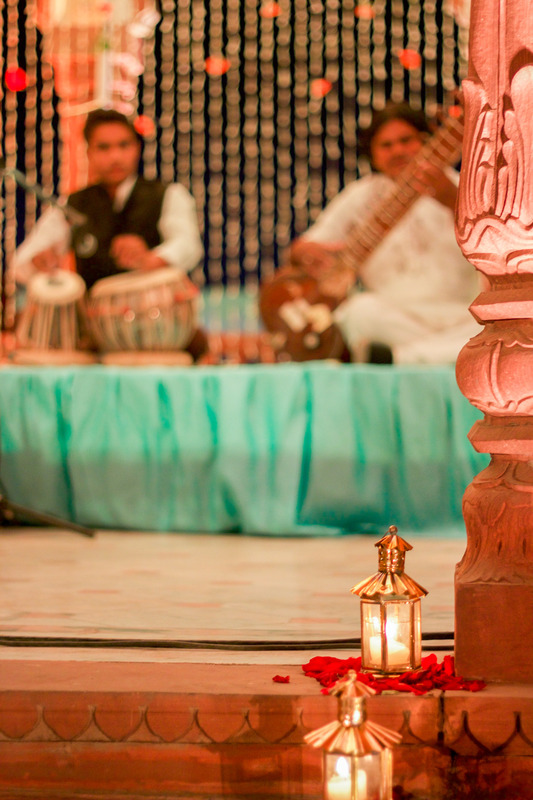 It was incredible to see the different rituals in a traditional Hindu wedding. 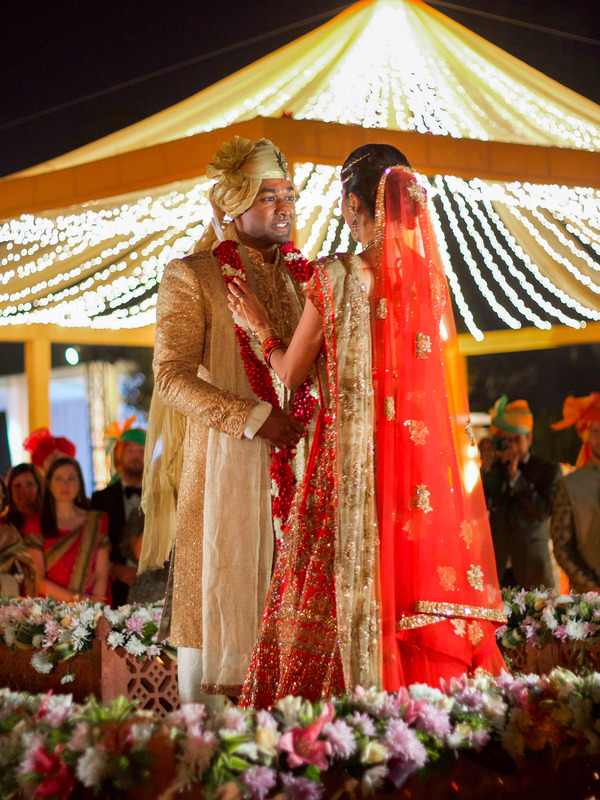 We are so used to seeing the bride and the groom recite the words after the pastor, before finally saying “I do.” But there are so many cultures around the world that have other ways, just as beautiful and just a meaningful, in order to help the bride and the groom pledge their lives to each other. Before this experience, when I thought of a wedding it was always the same. An altar, a bride in a white dress across from a groom in his tuxedo at the end of an aisle lined with chairs, exchanging rings and reciting, “with this ring, I thee wed.” I am sure that this is the image that many of you see as well when you are asked to conjure up a wedding scene in your mind. But that is not what all weddings look like. 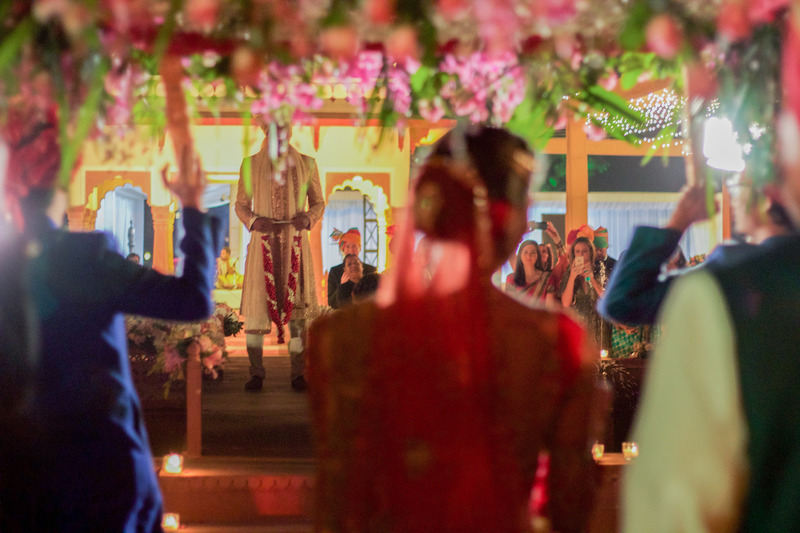 For billions of people around the world, the ceremony to celebrate their love and their commitment to each other look nothing like what I previously had in mind. But that doesn’t make them any less beautiful or any less meaningful. If anything, the differences across cultures solidified one thing in my head. No matter who you are, or what religion you believe in, love is the most important thing to every culture in the world. And to be able to witness a wedding to demonstrate this from an amazing culture different than my own is something that I will cherish for the rest of my life. 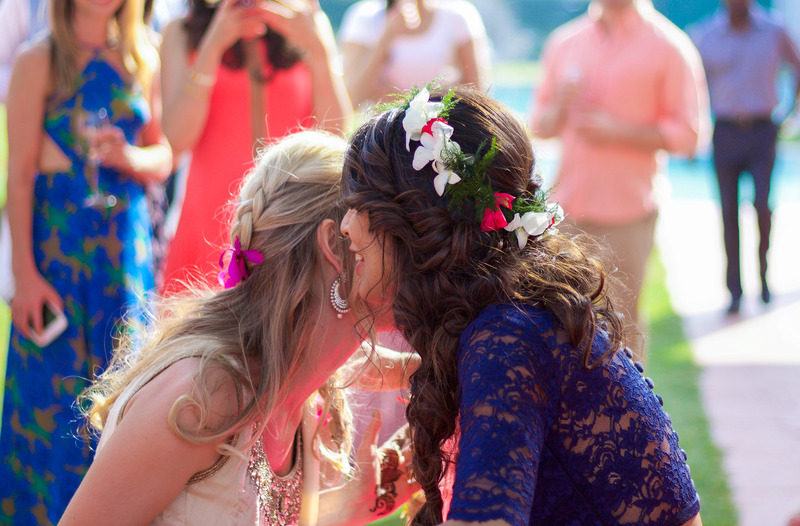 Omg Brittney, this beautifully written count of this wedding sparked my interest right away! I loved every minute of it. Thank you for posting all these gorgeous pic’s & for opening my eyes to cultural differences. My curiosity has had a boost! 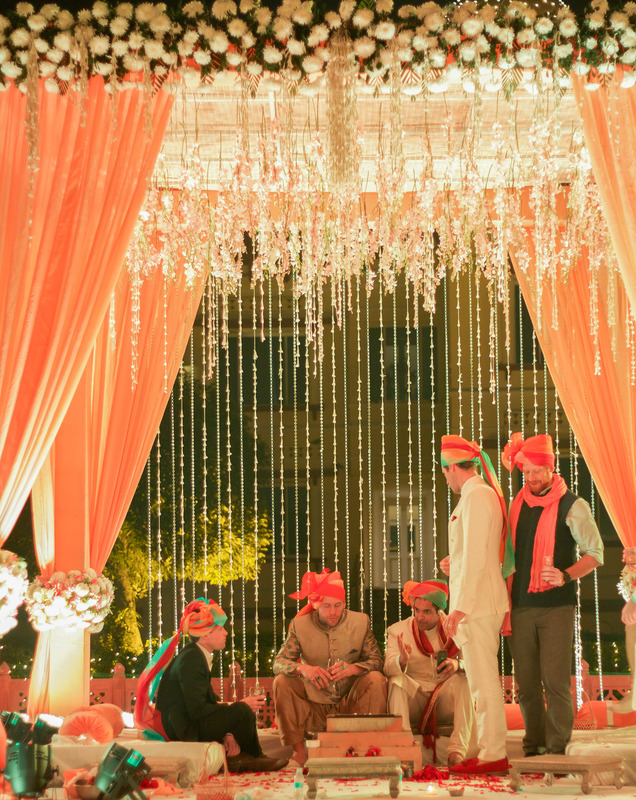 It was wonderful to go through this beautiful write-up with so much detailing and the pics of this Grand Wedding.Love, warmth seemed to be all over.This Indian Hindu Vedic Ceremony Wedding seemed to depict India,s culture of welcoming their guest,s with utmost care irrespective of Nationality and prevalance of multi culture.All seemed to be made to feel at ease inspite of being unaware of the Ceremony proceedings.Applying of henna and wearing bangles on the wrist in the very Indian style must have been great fun for the ladies leave alone the wonderful food, drinks and the amazing dances to participate in. 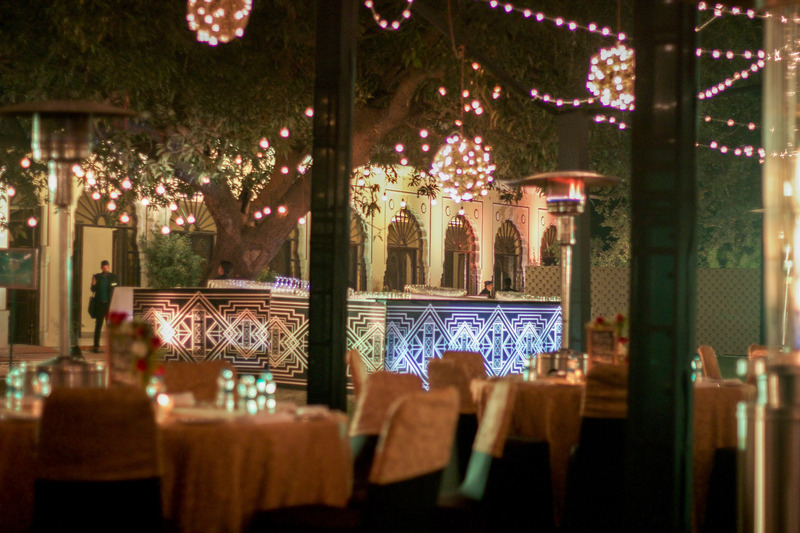 Radha, what can I say, you sure know how to throw an event! I’ve used the words “the most beautiful event I’ve ever attended” many times when describing to friends in the US how lovely everything was!! Thank you for hosting us!! 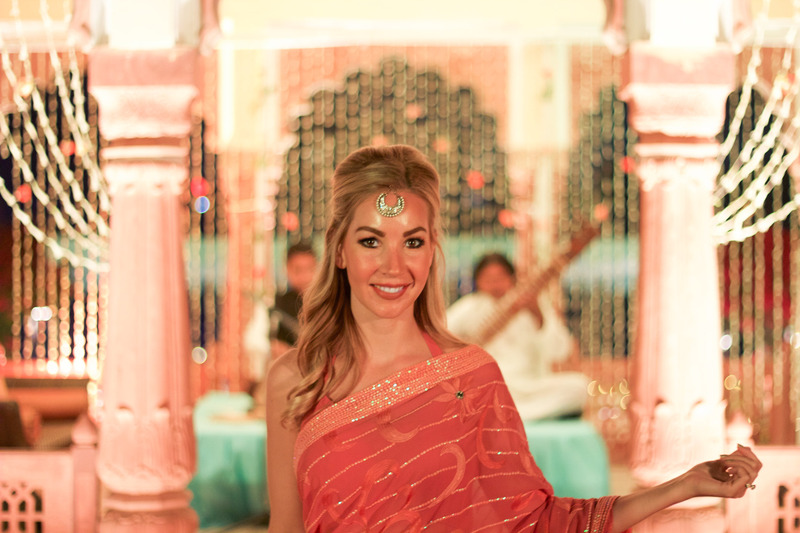 Brittney – this is an incredible blog post on your experience at your first Indian wedding!! 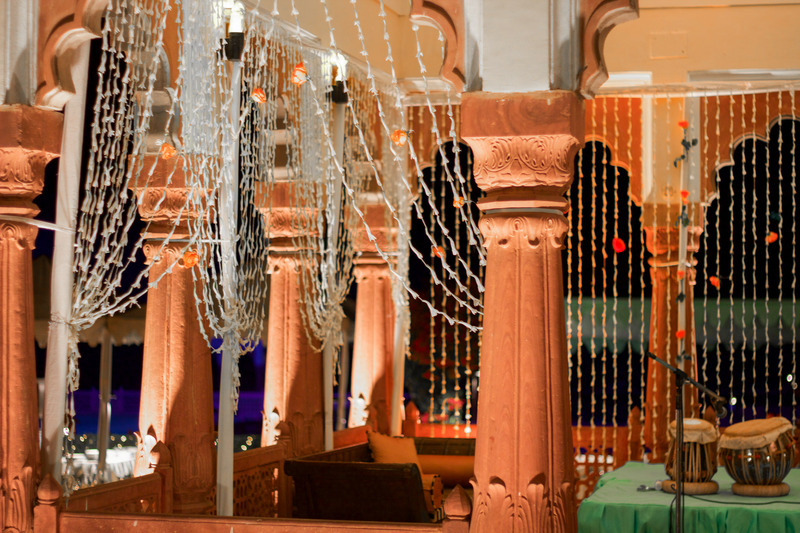 It’s so refreshing to see the non-Indian perspective – especially because we take it for granted how elaborate our Indian weddings can be! ???? Love your writing, keep it up! Thank you for reading Priyanka!! Brittney, thank you for posting this blog- what a beautiful and helpful way of showcasing an event! I am going to my first Indian wedding and I am VERY excited! Any chance I can borrow these outfits? lol I’m semi-joking but totally semi-serious. All events are very entertaining and exciting. Pictures are awesome.Thank you for posting all these gorgeous pic’s & for opening my eyes to cultural differences. This was wonderful to read – especially as a fellow Bostonian. 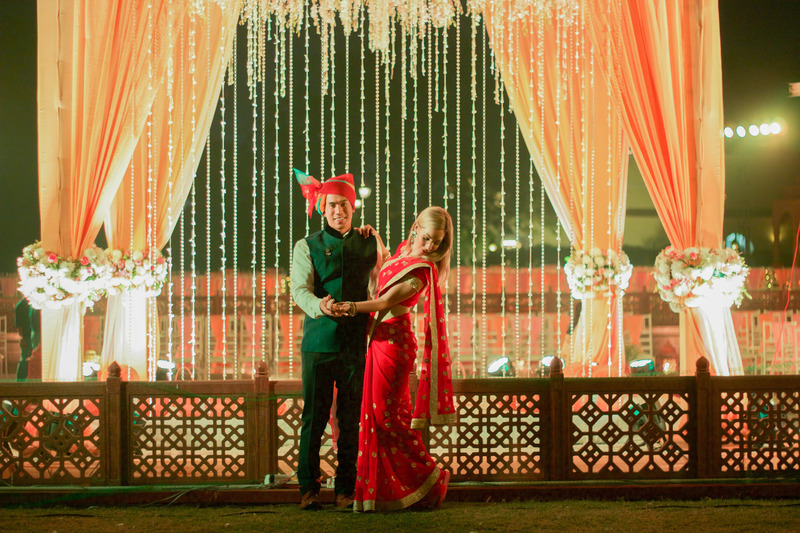 My best friend is getting married in Jodhpur this January, so your post was quite helpful. Can you tell me, too, whether you saw different kinds of outfits at the different ceremonies? For example, was eeeeeevery women wearing a saree for the ceremony? Or is it kind of up to whatever you want to wear, in whatever color? 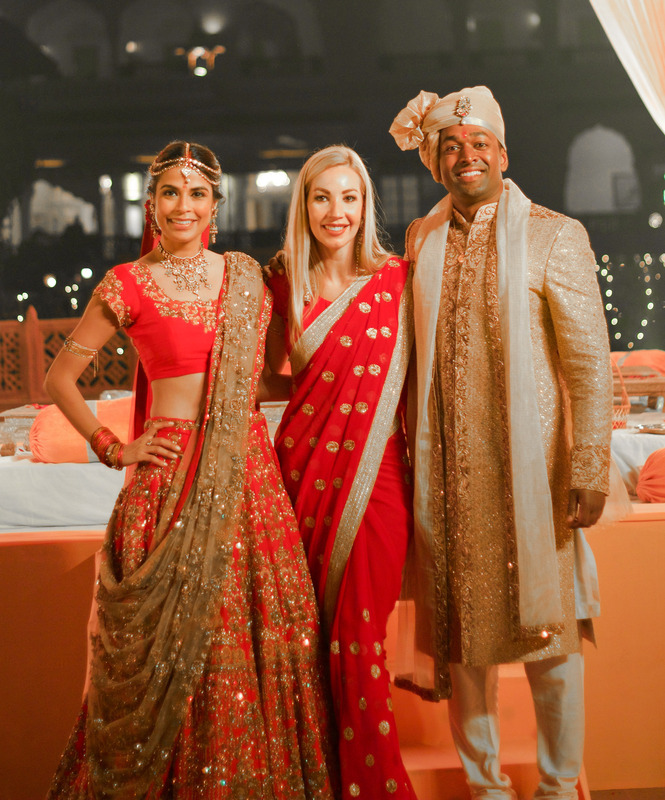 Brittney, I totally loved your blog post on Aditi and Jay’s wedding! You looked so gorgeous in all the wonderful Indian outfits! Keep up the great work! 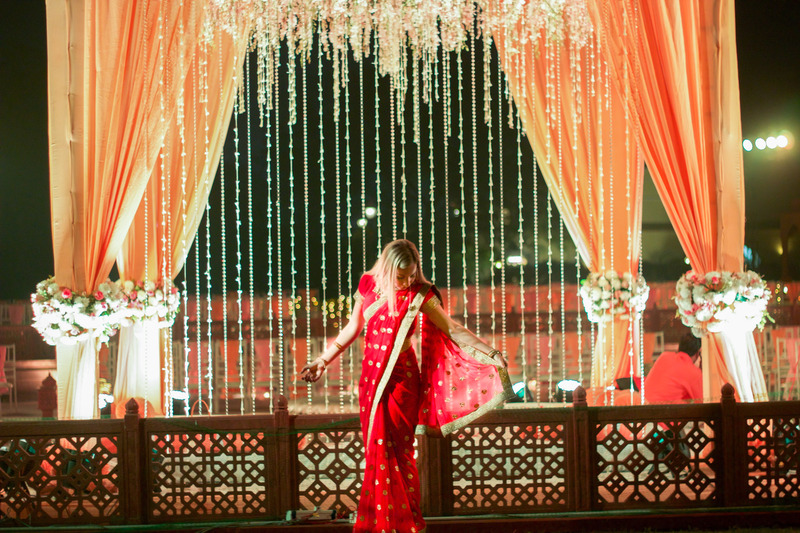 Olivia, I have been to many Indian weddings and not everyone wears Saris to every event. It’s up to you to choose which outfit to wear to which ceremony. Usually for the Henna/Mehendi Ceremony wear something that is comfortable and if you’re going to get henna tattoos then you should definitely eat before you get them.